Thank you for your interest in Phoenix. We here at Phoenix want to make sure that you have a great experience no matter what brings you here. Many come to Phoenix seeking employment, others for help finding a job and still others to gain skills that will prepare them for future career choices. You may be the individual seeking assistance, a family member or simply a person interested in what we do. You are all welcome! Phoenix is a service organization first, with a mission to assist individuals, primarily those with disabilities, improve the quality of their lives. And the Phoenix organization is uncompromising in its application of this mission in all that we do. I am sure that it is easy to understand how our vocational services programs such as Vocational Evaluation, Job Placement, Supported Employment and Educational Services help individuals, but what are all the other things going on such as cleaning Redstone Arsenal, manufacturing interment flags for the Department of Veterans Affairs and keeping hundreds of acres of grass cut? Therein lies the magic of Phoenix. Phoenix does all of those things to either directly or indirectly help people improve the quality of their lives, in most cases through employment. 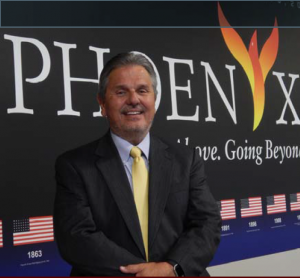 My career with Phoenix has spanned over forty years and I have seen a lot of changes but what has not changed are the relationships and partnerships that helps build the foundation of Phoenix. First of all the Alabama Department of Rehabilitation Services (ADRS) has been an ardent supporter providing Phoenix with access to individuals in need and financial support for over forty five years. From the state level to the local level, ADRS has facilitated Phoenix reaching twelve North Alabama counties serving thousands of individuals with disabilities. Also an essential partner, SourceAmerica through the AbilityOne Program has been essential in Phoenix gaining major government contracts to employ individuals with disabilities. Through this program, SourceAmerica has facilitated Phoenix opportunities in multiple states, but none more evident than here in Huntsville/Madison County on Redstone Arsenal. And that brings me to yet another very important partner, Redstone Arsenal and most of its tenants including the US Army, MDA, FBI, ATF and the US Navy. Over 400 individuals with disabilities are provided quality employment due to the Redstone Arsenal SourceAmerica Partnership. Phoenix also operates a manufacturing facility partnering again with SourceAmerica to provide numerous products to the US Government, including interment flags, parachute harnesses, back packs, sandbags, strapping, fire containment blankets, cargo nets and many other canvas goods. These are produced for many customers such as the Department of Veterans Affairs, the US Army, the US Air Force, the US Navy and the US Forestry Commission. As with other Phoenix contracts, a minimum of 75% of direct employees are people with disabilities. Even though the list of Phoenix partners goes on and on, I want to clearly recognize and affirm our most important partner, the community of people with disabilities that we serve or will serve. With an unemployment rate greater than any other working demographic, people with disabilities will continue to be the focus of Phoenix. Our mission is clear as is our vison of a community free of barriers. Our values are people, accountability, customers, ethics and safety. Thus Phoenix will, with all of its resources and actions, continue to advocate that all people have access to quality employment because through employment, comes empowerment.